I started writing a blog post about how to embed eLearning content into conversations. It was ok. But I didn’t love it. 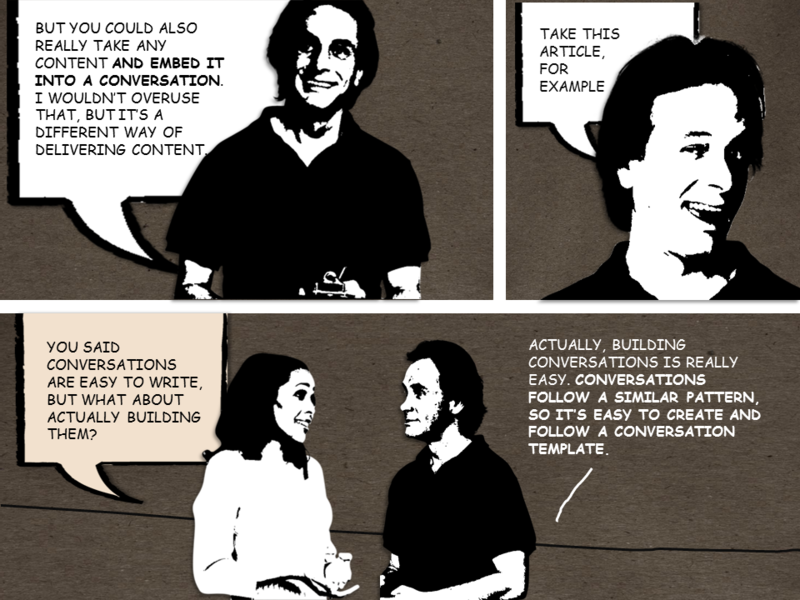 Then I had an idea: why not take that same content and embed it into a conversation? I also included the original article below that. Let me know which style you prefer in the comments. eLearning isn’t the only medium that embeds educational content into dialog. Think of tv interviews, infomercials, and even books. In fact, in business school, I remember reading an operations book called The Goal. This book moved away from a traditional textbook-style approach and instead used conversations between an operations expert and a newbie to reveal dry content in a more interesting way. I’m not saying that every course you create should now be a conversation (the expert teaching the newbie story can get old fast), but this is one more tool in your tool belt. In most of this article, I’m talking about the value of conversations alone. But conversations can be an element in other effective eLearning approaches, such as to set up a scenario or tell a story. 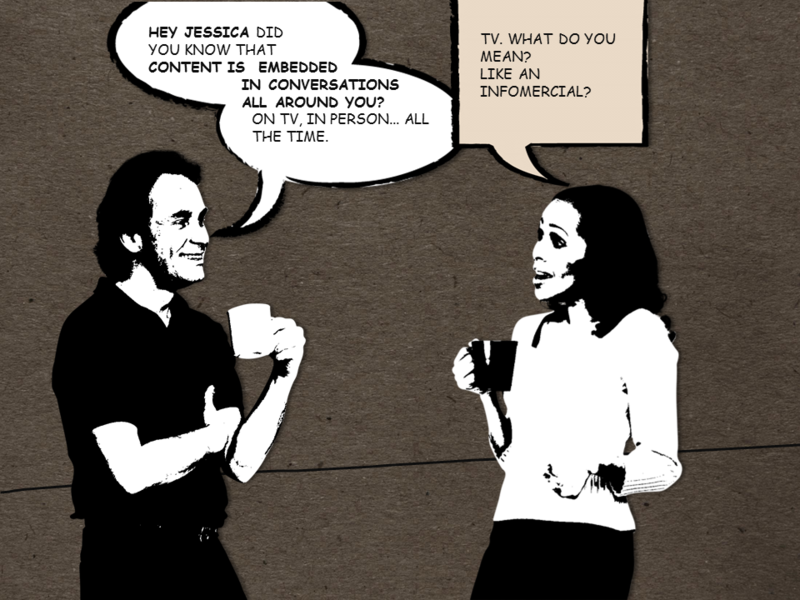 Below are 6 reasons I like embedding content into conversations. One of the advantages of incorporating characters in your eLearning courses is that shifts the tone from formal to informal. 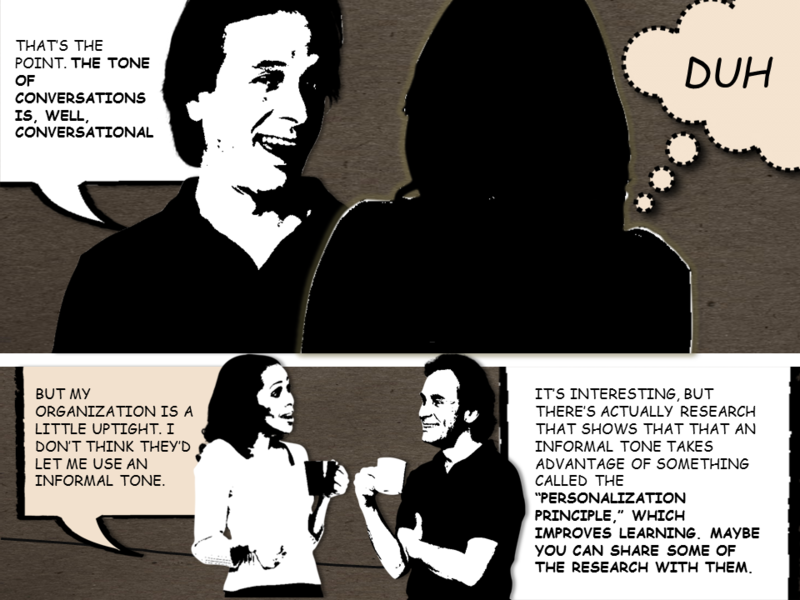 As Clark & Mayer discuss, an informal tone takes advantage of the “personalization principle” that helps improve learning. Just like using avatars and presenters, conversations between two or more characters allow you to create an informal tone. Writing in an informal tone is actually easier (and better). As Cammy Bean recommended in our interview “talk as if you’re sitting down at a table having coffee with someone, having a conversation about this content.” Once you embrace this, the writing will flow a lot quicker, I promise. It doesn’t matter if you’re not the subject matter expert (SME) on the topic. If that’s the case, think about how a top performer would explain the content in a language that the learner would understand. 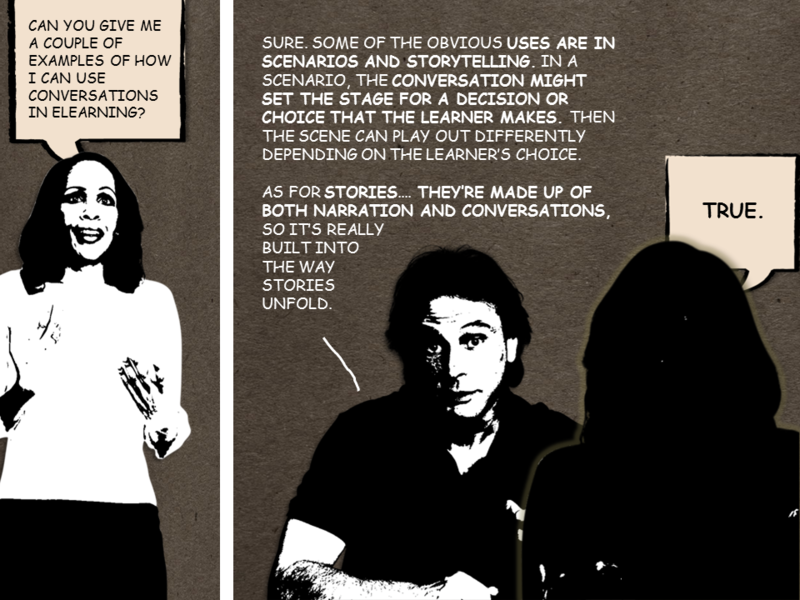 Conversations are an element that can be a part of both scenarios and storytelling in an eLearning course. My first job out of college 15 years ago was at SmartForce (now SkillSoft) as a simulation developer. We’d often use characters in conversations with subject matter experts. We had one course on basic web-site development where the main character was someone in the marketing department who had to meet with a number experts to learn more about the website development process. The main delivery of content was through these conversations as the character went from room to room talking to various subject matter experts. The nice thing about using conversations in a course is that they contain similar elements. In a previous post, I talk about the 8 essential angles of a conversation and show you how to build reusable templates. Think about an infomercial. It’s often 2 people. One plays the role of the expert and the other person is a beginner who is AMAZED as they learn more about the product. This beginner asks the questions that audience might have and allows the expert to share information through a conversation, which feels less like a sales pitch. The same is true for an interview. The interviewer asks a person the questions that the audience members want to hear about, but it flows as a conversation. In an interview or informercial, the “interviewer” or the “beginner” gets to ask the “stupid” questions that the audience might have without the audience having to ask. It takes the pressure off the audience (or the learner in our case). Do you like the graphical approach with content embedded in a conversation or the more traditional approach of a standard blog post? I have seen elearning where the designer has attempted to use a conversational approach and really missed the mark. The training may come across as too folksy and unprofessional. BTW, like what you did with the characters. The black and white provides a new look for stock images. Thanks Joe! I think it’s really important to get the tone realistic. I think one thing to do is get it in front of some trusted people within your audience and ask if sounds realistic. Thanks about the deisng of the character. Everything you see is actually built within PowerPoint with native “artistic effects.” Pretty cool, right? In this cartoon, I was trying to de-emphasize the background and characters and make the conversation the focus. WOW! This is great. What a fantastic way to present this. It is interesting that when visually looking at this post, first glance is that it isn’t that long. The brain think “I can read this in no time”. In comparrison to the full posted article, first glance is “that’s a lot of words…do I have time to read this”. The conversational tone can make a dry material more interesting. It feels more engagining; it’s simple, too the point, but full of information. As you pointed out it’s simple to create and accomplish as well. I love the idea and now need to find the perfect opportunity to repurpose this use of graphical converstation. Thanks Tracy! It was something new and fun for me to create. I think this is great, especially when compared to the printed version below the conversation. I just skimmed the written version – I got bored and disinterested quickly , but I read the visual conversation with interest and anticipation! The pictures, the use of artistic effect on them, their variety, and positions of the “participants” adds to the effect and they should not be overlooked as an important factor in the appeal of this style. But it works. I like it! I’m glad you liked the graphical approach. I like the standard approach better, because it is more structured with the headings, additional links, etc. and certainly easier to read. However, I like the other approach in theory, and will probably use in the future. I think that the reason I have a problem with this particular example is that it seems like too much information, and even though the design mimics a conversation, it just didn’t feel realistic to me. Embedding content in a conversation may be better suited for smaller chunks of information. I agree with DL Carter. There was way too much information being provided for a standard ‘conversational template’. I have used conversational mode in a project that was ILT-based and was purely technical (How to build a real data warehouse using a particular technology). It worked very well there as I guess it was a book-based. The conversational approach is good for content that is short and precise. I would use this approach to create case studies in my future courses as well. I agree – the image format was very difficult to read. Also, there are missing words, words added where they shouldn’t be (an extra “you” in the first panel for example) and other grammatical errors that threw me off and made it even more difficult to continue. I found the standard approach much easier to read. I find this to be an interesting approach, but, as DL Carter mentions, perhaps for smaller topics or conveying less information. Amanda- Thanks for the feedback. Whoops! Sorry about the typos. I just cleaned up a few of the mistakes about re-posted the new images. Thanks Parul. How long was the conversation in your ILT? I’m curious if you think the length that “works” would be different for ILT vs online. It was an entire 40 page book – how to build a data warehouse! The concepts were covered in earlier books that we wrote (a team of three people). But for this part, I was responsible for the entire analysis, design, and development and it was so much fun…And it was pretty long! For online courses, the conversations have to be short and crisp. I am usually verbose when creating an ILT as space is not a constraint. However, in most online/elearning courses, space has to be used effectivly – and there is always a choice between how much text and how many graphics we can show. Also, the learner attention span is pretty short when stuff is online. I have provided a summary of what happened in the book – everything in there was in a non-formal and conversation mode.. This book encompassed the entire life cycle of a data warehouse – start to finish. Learners had already learnt the concepts about building a data warehouse and this book was their practical project work. The book was about a fictitious company that wanted to build a data warehouse. I tried to simulate real-life conversations in that I created several ‘meetings’ between the stakeholders of the company (who wanted the data warehouse built) and my fictitious software development solution specialists (who were going to build the data warehouse). For example, the VP of Operations, Mr VPO was meeting up with the Data Warehousing Specialist, Ms. DWS and her team – Goal: to identify types of reports the VP would want to see – How: by implementing drill-down and drill-up concepts theoretical part of the data warehouse (the learner should have learnt this earlier)! And the learner was part of this team..This scene contained all the necessary information to achieve the goal, but strewn across the conversations – questions/answers between Mr. VPO and Ms DWS+team. I had so much fun doing it..! I loved integrating the concepts of technology in a real-life simulated mode..! What a fun project! Thanks for sharing the summary. 1. Space: Utilize the space effectively, else putting too much text/graphics will distract the learner and he/she will skip that stuff – like I do sometimes it something is taking me too long to read. 2. Verbose: Shorten the length of the text to make it more concise and crisp. I would use adjectives sparingly as they would increase the amount of text the learner would see without adding much value. 3. Context: If we can establish a context for the conversation before presenting the actual “talk” among characters, it puts the learner in a frame of mind where he/she is expecting the characters to have a conversation to discuss a concept. 4. Language: Simple words in the conversational bubbles. As a user, if I see text that is “too much”, I usually skip that part. So, when designing conversations, we can focus on the content by presenting it in a “talking style” manner. 5. Flow: The links between each ‘sub-conversation’ (one character asks, the other(s) responds..) has to be there, else by the time the learner moves to the next sub-conversation, he/she has already forgotten what he/she read earlier. 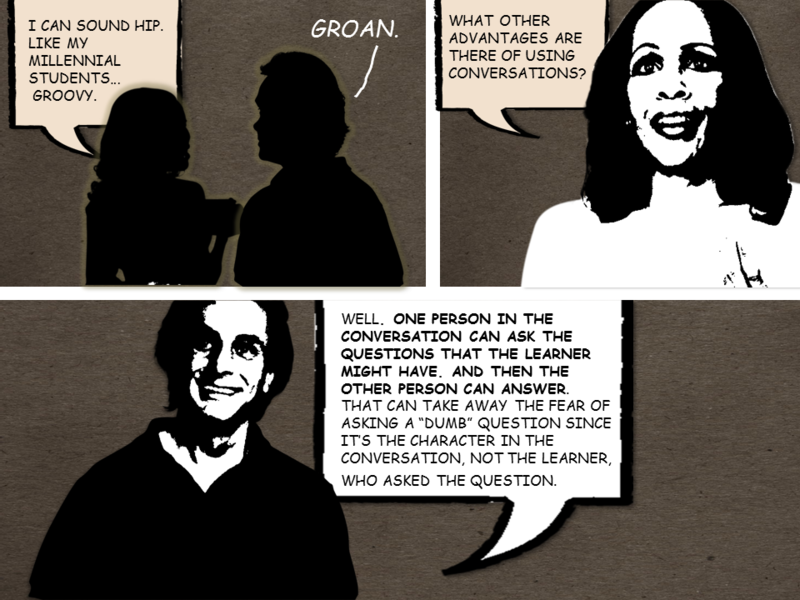 In such a situation, the link between the two sub-conversation breaks and the learner gets lost. 6. Transition: Similar to flow, transitions between different moods/ideas/concepts being presented have to be smooth. The basic tone of the entire course has to be the same though we might be presenting radically different ideas to the learner within that course. Transition would help us there, to ensure that the tone is carried on till the end– so to speak. 7. Design: This is one of the most important aspects for online courses/articles. The design has to be intuitive – the learner is able to guess what he/she can expect next – this gains their attention. The fonts I feel play a major role – using clean looking fonts can work wonders for the course. I really enjoy building course that employ this style of writing – though many feel that this mode is too casual. But personally, conversational mode topics can be much fun to create as they are to read! Thanks for the feedback DL. I agree that for scanning and information heavy content, the blog format makes sense. It’s interesting though…the book I mentioned (The Goal) was an operations book (yawn) written in this sort of style and I thought it worked pretty well. It probably depends on the content, the audience, and the writing. Thanks for sharing this, Bryan! It’s fun addition to the toolbelt and I plan to try it in the future for scenarios or short chunks of information. Like Joe Kirby, the black and white offers a new look to the stock photo characters. Sue. I totally agree. I’m not going to switch every blog post to this style and I don’t think anyone should make every course like this either. But it’s an interesting and different approach. I like it. It follows Mayer’s Principles and is to the point. Having an informal chat situation catches the mood. I do enjoy it when teachers develop different approaches. It can be used in different subject matter situations too. A template for different subject matters would be great here wouldn’t it? Thanks Coyote. The graphic version definitely had a different tone than the blog post. 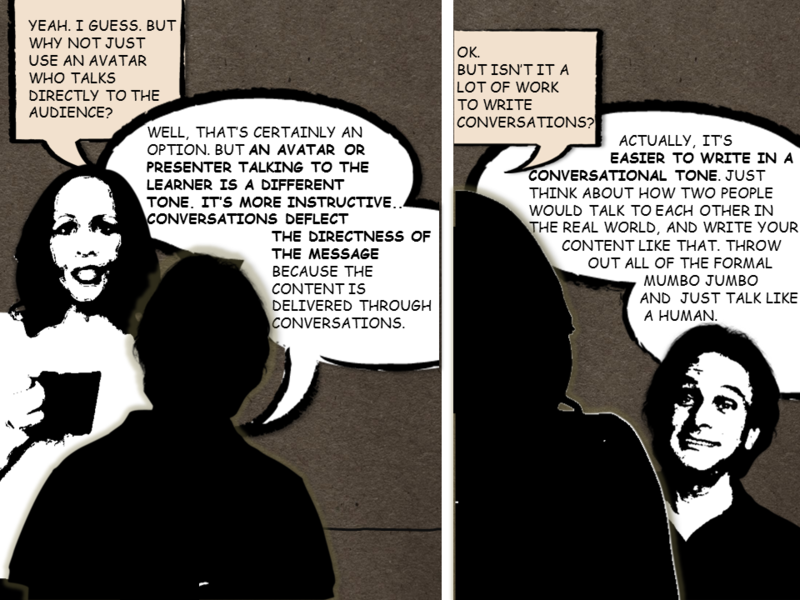 The ‘graphical conversation’ is an engaging approach. It’s visual. It breaks the text into easily-digested chunks. And it puts a face on the content. But, I don’t think it’s terribly effective in this particular context. Also, there really isn’t any drama or emotion in the conversation version. No stakes. No problem. I wasn’t compelled to get to the end of it. Maybe Jessica was struggling with a difficult, make-or-break project and didn’t know how to approach it – as a rough example of a scenario. In my experience, when you introduce ‘dialogue’ between ‘characters’ we tend to expect some kind of emotional pay-off (as well as a certain level of authenticity). 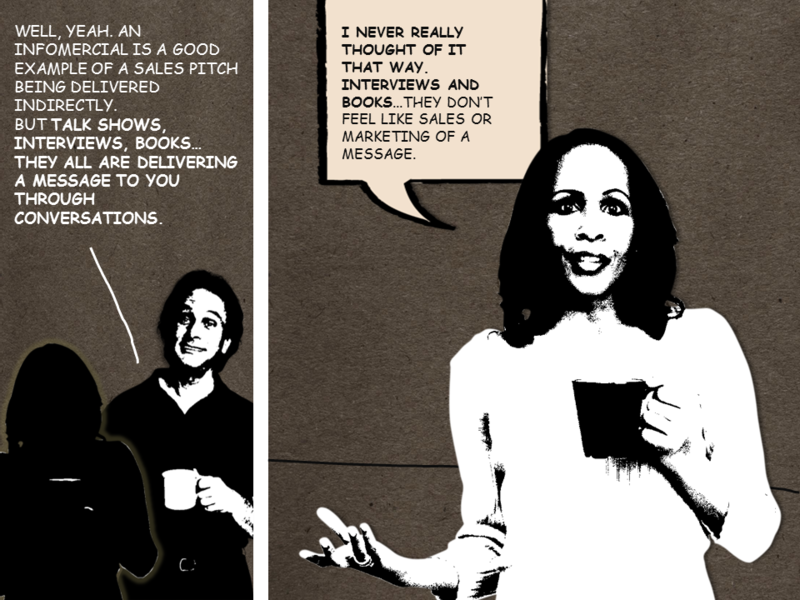 But overall, used effectively, the ‘graphical conversation’ approach can be powerful. Just look at the success of comic books and graphic novels. This whole exercise has been very useful, so thanks for posting, Bryan. I love the way you presented the example in both formats for comparison, and the comments have been very helpful too. Like Bryan, I used to work for what’s now SkillSoft – I was an ID at Tarragon International. A big part of the storytelling in Tarragon’s courses was the dramatic element, and we used actors in the courses’ photos and videos. I do agree with many of the comments, especially Michael Kinney’s. So I advise reviewing any dialog for realism by reading it aloud – preferably with different people reading the parts so you can better tell if it sounds lifelike. In fact it’s interesting how varied the comments have been. My guess is that learner reactions might be similarly diverse – and stakeholders even more so. So if trying this as a new approach, it’s good to get buy-in early on, and test with learners well before launch. Thanks Craig. I’m glad you found it useful I’m not sold 100% on either solution being the “right” or “only” way to design, so it was kind of fun to see the two approaches side by side. Agreed that writing a good script that connects with an audience takes time and multiple reviews. Thanks Michael. I agree that there wasn’t an emotional payoff. I’d compare this more to an “infomercial” than to a story. That would have taken substantially more time, but could have possibly been more effective. I’m totally with Tracy on this one! Awesome! Must find a project! Thanks Jeff! It’s a fun project. It’s probably 2/3 writing and 1/3 design. Good luck! Great presentation. I have used this approach to training in two CBTs recently. They were *very* well received. Thanks for sharing this important concept! Awesome Vicki. Anything you can share? I’d love to see what you came up with. Thi could be a useful tool in web based training quizes as well. Using hotspot selection you could give one person in the conversation multiple answer options…. Jason. For sure. This was actually built in PowerPoint, so you could just use hyperlinks to other slides within the same file. I think that would be a great use. Scroll to see several conversations.